According to the study, in 2016, India accounted for 17.8 per cent (130 crore) of the global population but recorded 36.6 per cent (94,380) of the 2,57,624 suicides among women across the world and 24.3 per cent of global suicides among men. The Lancet paper warns of an impending public health crisis. Almost four in every ten women who commit suicide across the world are from India; 71.2 per cent of suicide deaths among women in India were in the 15-39 age group; between 1990 and 2016, the suicide rate among women in India reduced by almost 27 per cent. These are among the findings of a paper, “Gender differentials and state variations in suicide deaths in India: the Global Burden of Disease Study 1990-2016,” published Wednesday in The Lancet Public Health. The study found that India’s contribution to global suicide deaths increased from 25.3 per cent in 1990 to 36.6 per cent in 2016 among women, but at the same time, the age-standardised suicide death rate (SDR) among women in India reduced by 26.7 per cent from 20 per 1 lakh population in 1990 to 14.7 per 1 lakh population in 2016. According to the study, in 2016, India accounted for 17.8 per cent (130 crore) of the global population but recorded 36.6 per cent (94,380) of the 2,57,624 suicides among women across the world and 24.3 per cent of global suicides among men. Compare this to 1990: India had 16.4 per cent of the global population and accounted for 25.3 per cent of global suicide deaths among women. The Lancet paper warns of an impending public health crisis. “Young adults are taking their own lives in alarmingly high numbers, constituting a public health crisis. Suicide ranks first as the cause of death in India in both the age groups of 15-29 years and 15-39 years, as compared with its second and third rank globally in these age groups, respectively,” stated the paper. The paper published in Lancet is part of the India State-level Disease Burden Initiative, a joint initiative of the Indian Council of Medical Research (ICMR), Public Health Foundation of India (PHFI), and Institute for Health Metrics and Evaluation (IHME) in collaboration with the Ministry of Health and Family Welfare. In 2016, as many as 1,45,567 youngsters between the age of 15-39 took their lives. Road traffic injuries were the second cause of death among the young in India at 115,714 deaths followed by 85,733 deaths due to ischaemic heart disease and another 79,845 due to tuberculosis. Prof Rakhi Dandona, lead author of the paper in the Lancet Public Health told The Indian Express that the age group of young adults was vulnerable to family/marriage issues and financial hardships. “Recent global reports showed that suicides were the main cause of death among this young age group,” she said. 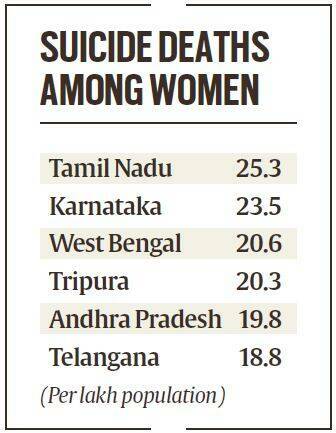 “Married women account for the highest proportion of suicide deaths among women in India. Marriage is known to be less protective against suicide for women because of arranged and early marriage, young motherhood, low social status, domestic violence, and economic dependence,” stated the paper. “As part of the Global Burden of Diseases, Injuries, and Risk Factors Study (GBD) 2016, we estimated suicide death rates (SDRs) for both sexes in each state of India from 1990 to 2016. Until 2017, suicide was a criminal offence in India, which led to under-reporting of suicide deaths in the National Crime Records Bureau,” said Dandona. Suicide deaths in India increased from 1.64 lakh deaths in 1990 to 2.30 lakh deaths in 2016, an increase of 40.1 per cent. Suicide was the ninth leading cause of death in India in 2016 with suicide death rate (SDR) of 18 per lakh population, accounting for 2.35 per cent of all deaths. The southern states of Karnataka (SDR: 30 per lakh population), Tamil Nadu (29.8/lakh), Andhra Pradesh (25/lakh), consistently had a higher SDR for both men and women. Among states with SDR lesser than 10/lakh-population are Jammu and Kashmir, Mizoram, Meghalaya, Nagaland, Delhi, Punjab, Jharkhand and Bihar. “Differences in socially acceptable methods of dealing with stress and conflict for women and men, availability of and the preference for different means of suicide, differences in alcohol consumption patterns, domestic violence, poverty, and differences in care-seeking rates for mental disorders between women and men have been cited for gender differentials in SDR,” said Prof Lalit Dandona, Director of the India State level disease burden initiative. These findings are in line with the earlier reports on suicide mortality in India, including the Million Death Study findings said Dr Vikram Patel, professor, Department of Global Health and Population, Harvard TH Chan School of Public Health. “There is no definitive explanation as to why the suicide mortality rates differ so much between states or why some of the highest rates are seen in states with better socio-economic indicators. One theory is that young people in these states face a greater challenge in achieving their life goals,” he said. What these latest findings show without a doubt is that suicide is a national public health emergency and the country needs an inter-sectoral plan to reduce suicides dramatically. “We need to be inspired by the fact that suicide is a health outcome which can be modified by public policies, and many other countries, including China and Sri Lanka in our region, have been able to dramatically reduce suicide rates through such policies,” he said.